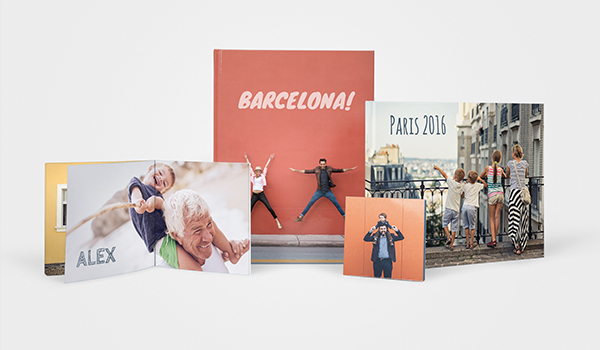 Explore the range of photo book sizes at bonusprint to relive life’s little moments or show off stunning landscapes on a grand scale. Head to our creator tool to get started and order yours online. For little gestures and impressive pieces for your home, we’ve got a great range of photo book sizes to suit you. Our small photo books make the perfect present or stocking-filler for someone special. And you can create a talking point in your living room with our extra-large photo books. You can start a series of family photos for your bookcase by customising one of our medium photo books. And our large photo books with a premium layflat binding are the perfect way to show off those big, beautiful landscape shots of skylines and cityscapes. Our photo books start with our smallest 10 x 10 cm square album and go right the way up to a huge 39 x 29 cm coffee table book. But no matter which one you choose, you can customise any of our photo book sizes with our easy-to-use creator tool. You can upload your favourite holiday snaps or landscape shots, and then go all out experimenting with layouts, text and backgrounds. And if you need a little help, our Smart Assistant can pick your best snaps and arrange them for you in a flash. When you’re happy with your customised design, click ‘add to basket’ to see what extra options you can select for your photo book. Whether you’ve gone for a small or an extra-large, you can add glossy paper to any photo album size to get a greater colour contrast on your images. And if you’ve chosen a hard cover book without a cover image, you can pick from linen or faux leather at this stage too. All you need to do next is place your order and get your customised photo book delivered to your door.